Please click trcking # to track your order. AD digital photo frame schedule your video/picture to live in seconds. Just insert a memory card and wait for them brilliantly displayed with print like quality on best resolution. With a AD electronic picture frame, you can choose to have it display only one photo or slideshow of your product, your new launch service and play any video clip you at any designated time you like. Want to custom your order and have brand your own digital signage displays? Just check here. And check here for bulk order. 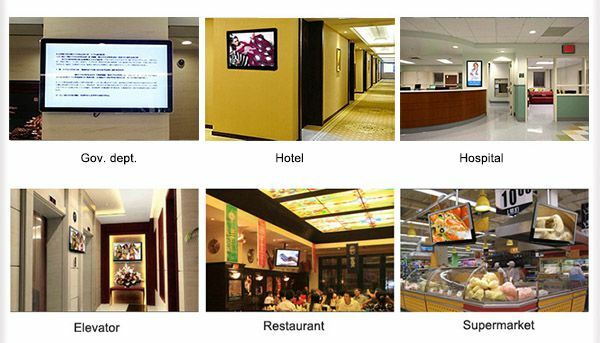 What wifi digital picture frame and digital signage displays for? Are you scratching your head, wondering what to get him for her birthday, your anniversary on Mother’s day, Father's Day, Valentine's Day, or Christmas? Looking for perfect gift for your wife, husband, friend, mother or father? Traditional picture frames is perfect for anywhere in your living room, your bedroom and your desk. Children and kids love the cute digital photo keychain, the teenagers would like to share their great moment with their friends, grandparents like to cycle through the latest digital snaps of their children rather than bother their kids to print out and send to them. Like all LCD product, the electronic photo frame is elegant, classy , modern and sleek, which allow you to view slideshows of your favorite pictures and videos. With EOOKE's digital frame and digital picture keychain, you can display an almost infinite number of digital photos and display your great moments with pride and keep it with you all the time. Are you looking for displays that can run your designated HD videos/music at special time? Do you want to turn on the machine and start to play in the morning then turn off at mid-night every day? Are you looking for a display that can be mounted vertically or horizontally and fit easily into any company/hotel/retail store/elevator environment? Are you also looking for screen with following features? 6. Metal housing + security lock, keep away from theft and damage. Q: How big should I buy? A: It depend entirely on the distance from the frame that the seating/Standing area is located. If you're not limited by a cabinet, please refer to following info to get as big as you can afford. Q: What should I buy? "What to buy" can be a stressful experience even for the tech-savvy, see - there are so many features, sizes, colors, technologies and flavors to choose from. So which one is right for you, your family and your biz? For Kids and elders: 7-9.7 inch which are able to play videos, music and slideshow photos, and have the feature of auto turn on/off-which allow it be turned on and off automatically when children forget to turn it off and fall asleep. For Biz: We recommend large digital photo frame that over 15". Just lay it on the table? 17"-19" with stand are best choice. Want to hand it to the wall and play commercial programs? Big 19"-65" AD player with wall bracket (see features above chart) are the right one-that what they designed for.